Released 10 November 2014, reached no. 5 and achieved at least Gold status. Available as a single or 'deluxe' double CD set, and later on 13 April 2015 as a four vinyl boxed set. Single disc length 75:44. Double disc 1 length 63:41, disc 2 length 71:53. This album is a collection of Queen ballads and love songs, and was available as a standard single album, or a 'deluxe' double disc album. Both releases featured three new tracks (although each one had been available before through solo or collaboration projects). The remaining tracks are all the normal album versions, some of which fade out slightly earlier but are otherwise identical. The only two tracks which have significant edits are 'Play The Game', which loses it's instrumental synthesiser intro, and 'You Take My Breath Away', which loses it's vocal outro. The set focuses on album tracks and lesser hits, with the single disc version containing 10 UK singles, 2 foreign singles, and 5 album tracks, compared to the double disc version having 13 UK singles, 5 foreign singles, and 15 album tracks. Both single and double disc sets contain just 5 UK top 10 singles. On the single disc set, the most represented albums are 'A Day At The Races', 'The Game' and 'Innuendo', with three tracks each. On the double disc album, they are 'Made In Heaven' with five tracks, and 'A Day At The Races', 'The Game' and 'A Kind Of Magic', with four tracks each. The least represented albums are 'Queen II', 'News Of The World', 'Jazz' and 'The Miracle', which each have a single track on the deluxe versions, and 'Hot Space', which has a single track on both single and double disc albums. There are no tracks from either the 'Queen' or 'Flash Gordon' albums. Altogether this is a reasonable track selection, but as always there are a few odd choices - the inclusion of 'Drowse' and omission of 'Teo Torriatte' and 'No-One But You' being perhaps the most obvious. The set also included an exclusive 12" vinyl, containing the William Orbit Mix of Let Me In Your Heart Again on one side, and an etching of the album artwork on the other. Single disc version track 1, deluxe version disc 1 track 1. Written by Brian May. Length 4:34. This track was originally recorded for the 1984 album 'The Works' but not completed, and subsequently recorded by Anita Dobson, featuring Brian, for her 1988 album 'Talking Of Love'. This mix features elements from a number of Queen demos, with new backing vocals from Brian and Roger, and new guitars from Brian. Single disc version track 2, deluxe version disc 1 track 2. Written by Freddie Mercury and Georgio Moroder. Length 4:10. This track was originally recorded by Queen for 'The Works' album, but unfinished. 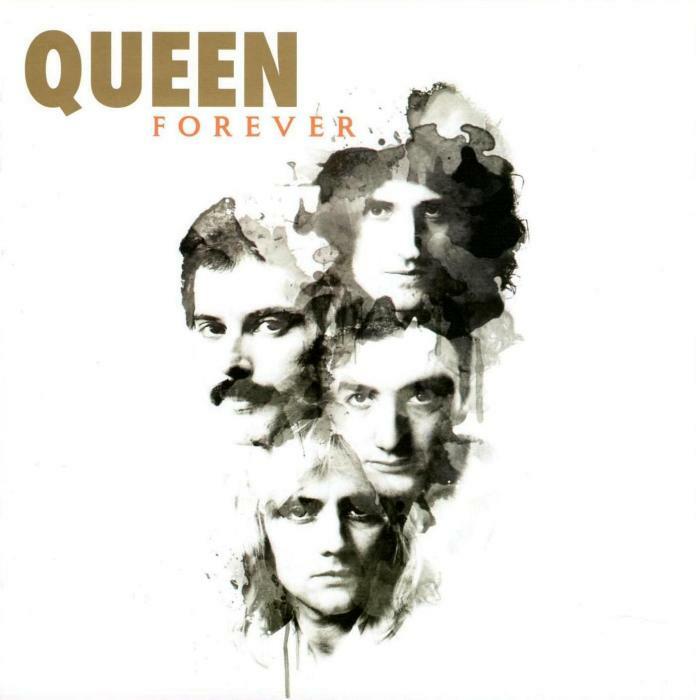 It was later completed by Freddie, and included on the soundtrack to the 1984 version of the film 'Metropolis', and released as a single, with Brian, Roger and John appearing on the track. This version was reworked by Brian and Roger as a ballad, adding new music to Freddie's vocals and John's guitar. Full details of the original version can be found on the Freddie Mercury Miscellaneous Songs page. Single disc version track 3, deluxe version disc 1 track 3. Written by Freddie Mercury. Length 3:26. This track was originally recorded by Queen for the 'Hot Space' and 'The Works' albums, but not completed. It was also recorded by Freddie and Michael Jackson as a duet, before being released as a solo track by Freddie on his 1985 'Mr Bad Guy' album. This version was produced by William Orbit, and features elements from both the Queen and Freddie/Michael demos, as well as new guitars from Brian and keyboards by William Orbit. Another version was produced by Chris Thomas, which Brian and Roger preferred, but Michael Jackson's estate refused permission for it to be released. Full details of the original version can be found on the Mr Bad Guy album page. Single disc version track 4, deluxe version disc 2 track 10. Written by Freddie Mercury. Length 4:08. Taken from the 1984 album 'The Works'. Single disc version track 5, deluxe version disc 1 track 6. Written by John Deacon. Length 2:50. Taken from the 1975 album 'A Night At The Opera'. Single disc version track 6, deluxe version disc 1 track 7. Written by Freddie Mercury. Length 3:32. This is a new edit of the track which appears on the 1975 album 'A Night At The Opera', which fades out slightly earlier to omit some of the outro. Single disc version track 7, deluxe version disc 1 track 8. Written by Roger Taylor. Length 3:38. This is a new edit of the track which appears on the 1976 album 'A Day At The Races', which fades out slightly earlier to omit some of the outro. Single disc version track 8, deluxe version disc 1 track 11. Written by Brian May. Length 3:32. Taken from the 1976 album 'A Day At The Races'. Single disc version track 9, deluxe version disc 1 track 12. Written by Freddie Mercury. Length 1:39. This is the single version of the track which appears on the 1974 album 'Sheer Heart Attack'. Single disc version track 10, deluxe version disc 1 track 13. Written by Queen. Length 3:39. Taken from the 1991 album 'Innuendo'. Single disc version track 11, deluxe version disc 1 track 14. Written by Queen. Length 3:37. Single disc version track 12, deluxe version disc 1 track 15. Written by Queen. Length 4:15. Single disc version track 13, deluxe version disc 1 track 17. Written by Brian May. Length 4:30. Taken from the 1982 album 'Hot Space'. Single disc version track 14, deluxe version disc 1 track 18. Written by Brian May. Length 5:14. Taken from the 1986 album 'A Kind Of Magic'. Single disc version track 15, deluxe version disc 2 track 7. Written by Queen. Length 3:50. Taken from the 1995 album 'Made In Heaven'. Single disc version track 16, deluxe version disc 1 track 4. Written by Freddie Mercury. Length 3:13. This is a new edit of the track which appears on the 1980 album 'The Game', omitting the synthesiser intro. Single disc version track 17, deluxe version disc 2 track 11. Written by Brian May. Length 3:47. Taken from the 1980 album 'The Game'. Single disc version track 18, deluxe version disc 2 track 2. Written by Freddie Mercury. Length 4:52. This is a slight edit of the track which appears on the 1976 album 'A Day At The Races', omitting a single piano note at the end. Single disc version track 19, deluxe version disc 2 track 13. Written by Brian May, Frank Musker and Elizabeth Lamers. Length 4:19. Single disc version track 20, deluxe version disc 2 track 3. Written by Freddie Mercury. Length 2:43. Deluxe version disc 1 track 5. Written by Brian May. Length 1:06. Taken from the 1974 album 'Sheer Heart Attack'. Deluxe version disc 1 track 9. Written by Freddie Mercury. Length 4:38. This is an edit of the track which appears on the 1976 album 'A Day At The Races', omitting the vocal reprise at the end. Deluxe version disc 1 track 10. Written by John Deacon. Length 4:30. This is a slight edit of the track which appears on the 1977 album 'News Of The World', fading out slightly earlier than usual. Deluxe version disc 1 track 16. Written by Freddie Mercury. Length 1:18. This is a slight edit of the track which appears on the 1974 album 'Queen II', starting a fraction of a second later to create a standalone version. Deluxe version disc 2 track 1. Written by Freddie Mercury. Length 4:50. Deluxe version disc 2 track 4. Written by Freddie Mercury and John Deacon. Length 4:07. Deluxe version disc 2 track 5. Written by Freddie Mercury. Length 3:13. Taken from the 1978 album 'Jazz', this is the 2011 version of the track which adds a bass drum. Deluxe version disc 2 track 6. Written by John Deacon. Length 4:27. Deluxe version disc 2 track 8. Written by Brian May. Length 3:31. Deluxe version disc 2 track 9. Written by Freddie Mercury and Brian May. Length 4:46. Deluxe version disc 2 track 12. Written by Freddie Mercury. Length 5:25. Deluxe version disc 2 track 14. Written by Brian May. Length 3:33. Deluxe version disc 2 track 15. Written by Queen. Length 4:58. This is a slight edit of the track which appears on the 1989 album 'The Miracle', fading out slightly earlier, while the last second is actually part of 'Is This The World We Created?'. Deluxe version disc 2 track 16. Written by Freddie Mercury and Brian May. Length 2:12. This track begins with the last second of 'The Miracle' but is otherwise identical to the album version. Deluxe version disc 2 track 17. Written by Freddie Mercury. Length 3:44. Deluxe version disc 2 track 18. Written by Brian May. Length 3:20. This is a piano version of 'Who Wants To Live Forever' and is taken from the CD version of the 1986 album 'A Kind Of Magic'.